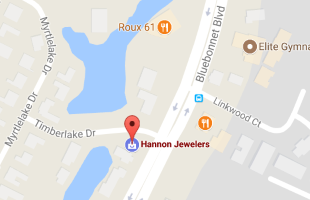 Does Hannon Jewelers offer discounts? What is the best way to insure my jewelry? How do I sell my jewelry? What are the quality factors for Pearls? Color in Pearls, are they natural or permanent? When buying a diamond, what is the most important thing? Do chemicals affect your gold? Why does jewelry sometimes blacken the skin or clothing? How do I keep my jewelry looking beautiful? How can I clean my diamond jewelry at home? How do I keep my Hannon's Ring it looking beautiful? Can the finish on a piece of jewelry wear off? Can I wear my gold jewelry every day? Platinum, Palladium, White gold: Which is best? Is this piece made of solid gold? Is my Jewelry made of pure gold? Is there a difference in color between 18k, 14k and 10k yellow gold? What does the “k” stamp inside a piece of gold jewelry mean? How do I know that a piece of jewelry contains the amount of gold stamped on it? Which are the European gold marking? What does the “p” stamped on my piece of jewelry mean? Gold Filled, Rolled Gold, Gold Plating. Gold color gold variations, How many colors gold comes in? Why do I have to have a water test? What are the various types of water resistance? What does "Water resistant to 10 or 20 Bar (ATM)" mean? Why does my watch get foggy if it is water-resistant? How do I care for non-water resistant models? We regularly offer our customers extremely competitive prices without having to play the discounting game. We believe in providing each customer with consistent exceptional value: good quality at every day good prices rather than through typical discounting measures. We create real value for our customers in everything we offer, including our products, specialized services, and special orders. We are familiar with the market value and with most gimmicks employed by some jewelry stores. At Hannon Jewelers, we price our products and services with a fair and very competitive price. Our everyday prices are, in most cases, lower than a competitor or internet "special discount" or "wholesale" price. The best part is, each and every customer gets that fair price without having to ask or bargain for it. Each person is treated equally regardless of income level, who you know, or who you are. That is because we don't believe in gimmicks, we believe in you, our customers, and that everyone deserves the very best of Hannon Jewelers. We set a fair price -with a reasonable profit. This way the price is always the same for all customers. Hannon has the best value in fine jewelry. Sometimes, when we need to reduce our inventory, we will mark our prices down, without ever marking it back up. The pieces stay at that price until the piece is sold. This is for a limited selection of jewelry that we need to sell quickly. Customers who ask for discounts generally find the clearance case a true bargain--a piece with a price that has been reduced from an actual price, not a price that was initially inflated to cover a discount. This policy has worked for Hannon Jewelers for over 50 years. Stores that advertise huge discounts are often engaging in deceptive pricing. To give you the illusion that you are getting a great bargain, they mark their prices down substantially from a fictitiously high list price that the store has never actually charged. Although this practice violates Federal Trade Commission rules, it is still very common. If you compare these so-called “marked-down” prices to the everyday non-discounted prices in most reputable stores, you will usually find the non-discounted prices are the same or even lower. Measuring the width of your finger is a simple process if the proper tool is used. However, your finger size can vary from day to day depending on many different factors. There is no simple answer to this question because our bodies - including our fingers - expand and contract with the changes in the weather, environment, the food we eat, medical conditions, and many other reasons from morning to evening. To measure one's finger, a professional jeweler must take in consideration the type of ring, its physical dimensions and if the ring will be worn on the right or left hand. For instance, a wide band will need a larger finger size due to the increased friction on the skin. An internally hollow band will need a tighter sizing than a solid one. A band with a flat wall inside will need a more loose fit compared to a comfort fit band. The job of a professional jeweler is to find the proper average size that will feel good on a customer's hand during all four seasons of the year in the area where the person lives. For this reason, Hannon Jewelers offers a free ring adjustment to our customer's new engagement rings to allow new couples time to become familiar with the changes of their finger size, depending upon the season. It is an art form. This hand-fabricating jewelry technic involves thin metal threads which are curved and twisted into delicate patterns resembling lace. This jewelry art can be traced back to mid 17th century in France where it was copied in many other parts of the world. Beautiful filigree brooches, pendant and earrings were designed with diamonds and sapphires in the Victorian period (1837-1901). Because of its design, filigree work is delicate and light weight. There are many pieces of jewelry currently mislabeled filigree because it resemble this kind of work, but real filigree is a hand-made miniature work of art passed down through hundred of years from one craftsman to the next. For more than 50 years, GIA has indicated the presence of diamond fluorescence on its diamond grading reports, but described it on the report as an identification characteristic only – not a grade, Moses said. The five terms GIA uses to classify the intensity of the fluorescence are: None, Faint, Medium, Strong, and Very Strong. Fluorescence is the effect that is seen in some gem-quality diamonds when they are exposed to long-wave ultraviolet light (such as the lighting seen in dance clubs). Some diamonds appear to glow blue, and less often green, yellow, orange, or a combination of these colors when exposed to invisible ultraviolet rays. This glow is called fluorescence, and lasts only as long as the diamond is exposed to the ultraviolet rays. Under most lighting conditions, this light phenomenon not detectable to the eye, it is not dangerous to the diamond or to the wearer. In addition to color, fluorescence also varies by strength – from none, faint, medium, strong, and very strong, as described on GIA grading reports. The fluorescence color and its intensity are additional characteristics that can help to identify a specific diamond. GIA studies have shown that the strength of fluorescence has no widely noticeable effect on a colorless or near-colorless diamond’s appearance. In fact, many prefer the appearance of diamonds that have medium to strong fluorescence. In very rare cases (fewer that 0.2% of the fluorescent diamonds submitted to GIA), some diamonds with extremely strong blue fluorescence may appear hazy or oily. Chemicals? What chemicals? "I don't use chemicals.."
What causes most prong breakage? Hoover & Strong discovered that chlorine and bromine are often to blame. Hoover & Strong is a prestige jewelry manufacturing and casting company known for their expertise and fine quality. They conducted a controlled experiment to determine the effect of common chlorine and bromine products on jewelry settings. These common chemicals are found in hot tubs, swimming pools and laundry products. Chlorine and bromine are commonly used chemical products to prevent bacteria from growing in our drinking water, in swimming pools and hot tubs. Excess amounts of these compounds may cause a human health threat and a durability problem for settings. The higher the concentration, the longer the exposure and the higher the temperature, the faster the deterioration of the settings. The experiment indicated that the rings soaked in heated bleach suffered the most catastrophic failure. 14k nickel white gold was the first to fail in all solutions except the household detergent. The household detergent had little or no effect on the rings or settings. Therefore, a consumer wearing a 14K nickel white gold setting (most common used alloy for diamond settings/mountings) would lose a stone or expect prong breakage with prolonged exposure to these chemicals. Hannon Jewelers's Recommendations: Use platinum settings, 14k palladium white settings or rhodium plate 18k or 14k white gold settings. The rhodium plating will provide a protective coating to protect the setting (similar to paint stopping rust). Also, we do not recommend wearing jewelry in hot tubs and swimming pools. Remove jewelry when using laundry or cleaning products. NEVER, NEVER clean rings with bleach! Please bring them to Hannon Jewelers for cleaning and inspection. If your skin turns black underneath gold jewelry, does it mean that it’s not real gold? Your problem is not uncommon, and is known to jewelers as “gold smudge.” It is caused by a chemical reaction between the piece and the wearer, or from tarnish. Consumers with this condition suspect that they have been cheated with their gold jewelry. While 24k gold does not tarnish, some alloys will. Both 18k and 14k gold jewelry are less likely to cause smudge than 10k, due to the fact that the higher karats contain less base metal. Some people are even allergic to some alloys used in gold jewelry. We have found many other reasons that causes this to occur including exposure to makeup, chemicals, a build-up of soap or lotion and perspiration. These chemical reactions on the gold jewelry often results in a blackened spot or area on some jewelry. Traces of some cosmetics on the skin or clothing is the most common cause of the blackening or smudging. Some cosmetics often contain chemical compounds which are harder than the jewelry itself. Metallic abrasion occurs when these hard compounds come in contact with the jewelry metals and wear or rub off very tiny particles of metal which appear as jet black dust. Very finely divided metals always appear black rather than metallic. When this dust falls on absorbent surfaces, such as the skin or clothing, it sticks, forming a black smudge. To prevent this, cosmetics which contain zinc oxide, titanium dioxide, ferric oxide and calamine should be avoided. If this is not possible, we recommend that you remove rings and other metal jewelry while applying cosmetics. Also, when this condition is present, it is advisable to clean those areas on the skin with soap and water that come in contact with the jewelry. Another cause of discoloration is due to the corrosion of the metals from which the jewelry is made. Pure gold itself will not corrode but is too soft for jewelry and therefore is alloyed with proportions of base metals – usually silver or copper. The composition of 14K gold is 14/24 pure gold and 10/24 alloys. Only the base metal used for alloying corrodes, leaving the gold untouched. The chemical compounds of silver and copper which are formed turn very dark, even when only slightly corroded. This corrosion occurs under moist or wet conditions - like in high humidity found in states like Louisiana. Our skin on which the jewelry lies, is provided with thousands of perspiration glands. Chemically the perspiration is mostly fat and fatty acids. These essentially mild chemicals are enough to cause corrosion of 14K gold, especially when aided by warmth and free access of air. When this happens, we suggest that you remove your jewelry often and use an absorbent powder, free of zinc oxide, on the areas of skin which come into contact with your jewelry. Rings containing copper and silver alloys, particularly sterling silver, corrode readily on the skin if enough salt is present. Simply exposing the hands to salted nuts, crackers, popcorn or other salty foods can cause such metal corrosion and skin discoloration. We advise washing your hands well if you are exposed to these types of items when wearing jewelry. Sterling silver is a copper-silver alloy and is somewhat softer than most gold alloys. Therefore, it is more likely to be abraded to black dust by relative movement between the jewelry and the skin or clothing. Sterling silver jewelry has a pronounced tendency to tarnish. The tarnish is always due to the contact with sulphur compounds. The main cause of tarnishing of silver is a trace of hydrogen sulfide gas in the air. This gas is particularly present in smoke from burning raw fuel, such as coal or oil, in some strong smelling foodstuffs such as eggs and onions, in some fish or shellfish and in polluted air. The tarnish may turn the jewelry black and may also be rubbed off on the skin or clothing. A few people with especially moist skin may find that the sterling silver stains their skin green. This is due to the copper component of the silver alloy. When this occurs you should polish your jewelry frequently and use an absorbent powder on those moist skin areas which come into contact with your jewelry. Soap, detergent, wax, polish, lotions and cosmetics may build up under a ring, causing a type of dermatitis. A burning sensation and redness of the skin results. The wearing of silver jewelry when manipulating photographic chemicals or solutions may cause staining of the skin. When silver is attacked by a chemical solution such as nitric acid, the solution of silver salt formed is reduced back to silver by the skin. This silver is in a finely divided form and causes an intensely black stain. Silver jewelry should be removed before working with photographic chemicals or solutions. The good news is this is not a permanent condition. Through regular cleaning and careful wear (i.e. avoiding contact with chemicals) the problem can be controlled. To prevent this, you should remove all rings before using soap, detergents or bleaches or perfumes, and clean rings frequently. We provide this information to our customers as a way to answer common questions about jewelry, and offer suggestions and solutions to these. Will the finish on a piece of jewelry wear off? Because the finish on a piece of jewelry is confined to its surface, there is always the potential for it to wear over time, especially with rings which are in constant contact with your skin and other objects. Finishes are more likely to last on items such as pendants or earrings, where there is minimal friction between the piece of jewelry, skin and clothing. On such jewelry, the finish will last almost indefinitely. If the finish does start to disappear from the piece, it can be reapplied, or refinished, by Hannon Jewelers. It is important to choose a piece of gold jewelry that is consistent with your lifestyle. If you intend to wear a piece everyday, you should steer towards more durable items. For instance, a rope chain as opposed to herringbone chain would be a better choice for a person with a very active lifestyle. Same principle will apply in selecting a diamond engagement ring and wedding band. Hannon Jewelers will help you select a design that it is not only beautiful and durable, but fitting to your life-style as well. To store gold jewelry, wrap each piece separately in a soft cloth. Lay herringbone chains flat so they do not kink. Always remember to remove your jewelry before sleeping, bathing or exercising. What does it mean when a piece is made of solid gold? If you mean is it made entirely of gold? Then, yes. However, the term “solid” can only be used to describe pieces of jewelry that are not hollow and are 10k or more in fineness. Is your Jewelry made of pure gold? Technically speaking, only gold with no additives can be called "pure". However, such gold labeled “24k” tends to be too soft to be used in jewelry. So various metals, such as silver, copper, nickel, palladium or zinc, are added to make the gold more durable and suitable for jewelry use. Once you add these other metals to gold, the entire mixture is called an alloy. Almost all gold used in jewelry is an alloy. Is there a difference in color between 18k, 14k and 10k gold? No, but there can be slight differences in color richness. The more gold a piece contains, the more vivid its color tends to appear. In general, 18k gold has a warmer, fuller glow than 10k gold. However, some manufacturers can minimize these differences by carefully adjusting the alloys used when making their gold jewelry. What does the “k” stamp on a piece of gold jewelry mean? The gold used in jewelry is almost always a mixture of pure gold and other metals. In The United States of America, the degree to which gold has been mixed with other metals is expressed in a unit called a karat, represented by a “k” on a piece of jewelry. When gold contains no other metals, it is said to be 24 karats (24k). Most consumers buy jewelry that is either 14k (14 parts pure gold and 10 parts other metals) or 18k (18 parts pure gold and six parts other metals). However, many jewelers are starting to stock gold that is 10k (10 parts pure gold and 14 parts other metals) which is the lowest fineness allowed for gold jewelry in the U.S.
Gold marking is regulated by Federal Law. Jewelry that carries a gold content mark must therefore meet certain gold testing requirements designed to prevent falsification. However, it is recommended that consumers shop at reputable retailers where jewelry is regularly checked for complete reassurance that the gold markings are accurate. Occasionally, you may see a piece of karat gold jewelry without any markings. The absence of a stamp (i.e. 14k or 18k) is perfectly legal because the government does not require manufacturers to stamp the amount of gold in a piece of jewelry. If a manufacturer does use a gold mark, federal law requires that it be accurate and accompanied by a maker’s mark - either the company’s initials or registered trademark. The maker’s mark helps in investigation of gold that falls below the mark. Although 10k is legally the lowest karat that can be referred as "gold" in the United States, Great Britain manufactures 9k gold jewelry (stamped 333) and Germany has 8k gold (stamped 250). Be aware that a piece of gold jewelry does not have to test (assay) to the exact amount stamped, but just has to come very close to it - three parts per thousand if the piece has no solder (a goldsmiths’ metal “glue” which holds parts together) and seven parts per thousand if the piece does contain solder. 24k=999; 18k=750; 14k=585; 10k=416; 9k=333; 8k=250. What does the “p” stamped on my piece of jewelry mean (i.e. 14kp)? While customers often think the “p” stands for plating, it actually refers to the word “plumb” - a goldsmiths’ term that means the piece is exactly the fineness indicated. This term is often confused with Gold wash or gold Flashed: A coating that is any thinner must be marked gold flashed or gold washed. When the base metal is sterling silver this process is known as Vermeil. The Code of Federal Regulations 16, Part 23.5 defines Vermeil: "An industry product may be described or marked as 'vermeil' if it consists of a base of sterling silver coated or plated on all significant surfaces with gold or gold alloy of not less than 10 karat fineness, that is of substantial thickness and a minimum thickness throughout equivalent to two and one half (2 1/2) microns (or approximately 1/10000ths of an inch) of fine gold." Citizen Eco-Drive watches use the simplest, yet most technically advanced power generating and storage system in the Watch Manufacturing Industry. A Solar conversion panel and energy cell are the power provider for these Quartz Watches. Eco-Drive's ability to use light from any source to generate electrical power means that the supply is limitless and free. The absence of any added complex power generating machinery that would require additional upkeep is another big advantage. Click here for more information about Eco-Drive Citizens watches.